Home | The Cost of Owning a Pet – Can You Afford It? Inside: Pets are great companions. Find out what impact pets may have to your budget before you bring one home. Have your kids been begging for a pet? Or are you ready for one yourself but are worried about how much it will cost? It is a valid concern because there are significant costs associated with owning a pet. A whopping 68% of US households have a pet and Americans spent $69.51 billion on their pets in 2017 according to the American Pet Products Association. That number is expected to increase to $72.13 billion in 2018. What are realistic figures for how much a pet will cost and how can you handle it? As with any expense, you’ll need to add your pet to your budget. Do you have wiggle room in your current budget to add a pet? Great! Besides ongoing costs such as food and litter (for cats), there are some one-time and ongoing expenses you’ll want to include. According to Petfinder, you are likely looking at a minimum expenses of $405 during your pet’s first year and at least $340 each year after. Those minimums assume the adoption fee and spay/neuter costs are sponsored and you keep other costs low. Otherwise, with better quality food and paying out-of-pocket for adoption/surgical fees you could be looking at around $2000 in expenses the first year. What about dogs? The costs are similar, coming in at a minimum of $395 the first year and $326 per year afterward. Expenses could easily creep well over $2000 the first year. In reality, people pay more because of pet illnesses, wanting to buy toys, pay for grooming, or needing to pay for pet sitting. Also, take into account annual local pet license fees. If you rent and the landlord allows pets, plan on paying an additional security deposit. With homeowner’s insurance, you could run into higher insurance rates with some breeds of dogs. Then there is the cost of needing to clean, replace or repair items your pet chews, scratches, or vomits (or worse) on. I’ve known cats and dogs that shred furniture, eat expensive leather jackets and shoes, and dig up carpet. And yes, that is why you probably won’t get that security deposit back. Ok, so pets aren’t cheap. 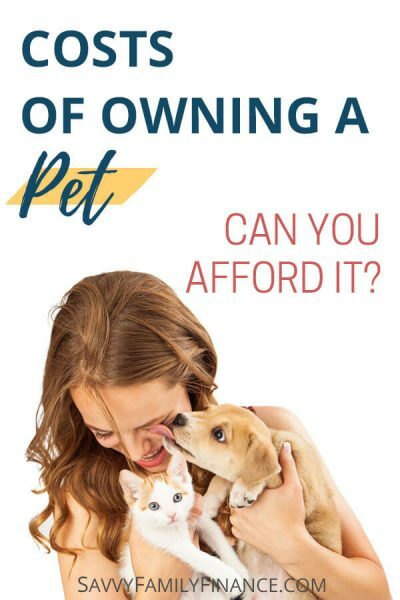 If all the potential expenses don’t deter you from wanting a pet, then it is still good to know how you can cut down on the costs associated with having a pet. You can start by adopting a pet from the local shelter or humane society rather than buying from a breeder or pet store. The fees will be far less and often include microchipping and spaying or neutering, or the services may be offered at a reduced rate. Approach cost-cutting for pets much like you do with yourself. Keep health care costs lower by scheduling regular checkups for your pet and stay up-to-date on vaccinations. This helps keep your pet healthy and hopefully spot problems early on before care becomes too costly. A pet’s gotta eat, so food will be an ongoing expense. You can watch for sales at stores such as Target, shop online, or look into membership deals at big box pet supply stores. Before you buy a food in bulk, do make sure your pet likes the food. There is nothing more frustrating than having your pet turn up its nose at a new flavor. Or, if your pet is like one of our cats was, seems to change taste (and texture!) preferences every couple weeks. As much as you hope for good health for your pet, there is a reasonable chance that your pet will be injured or become very ill at some point. Those emergency vet bills can cost hundreds, if not thousands of dollars. Yikes! One way to prepare for this is to create a pet emergency fund so you are prepared financially. Another is to look into pet insurance. Shop around for rates and coverage, and a small monthly insurance bill may bring you peace of mind and help protect your wallet. Pets are a great addition to the family. Ensure your lifestyle and your budget has room for a pet, then enjoy the time you have with them.